At the beginning of your upkeep, sacrifice Gargantuan Gorilla unless you sacrifice a Forest. If you sacrifice Gargantuan Gorilla this way, it deals 7 damage to you. 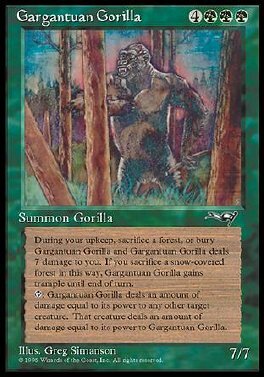 If you sacrifice a snow Forest this way, Gargantuan Gorilla gains trample until end of turn. T Gargantuan Gorilla deals damage equal to its power to target creature. That creature deals damage equal to its power to Gargantuan Gorilla.